The workshop was amazing! The children really enjoyed the warm up activities. Jane, Mo and Abbi were fantastic at drawing ideas out from what the children said (however bizarre the children’s remarks were). They worked well with our team to create a relaxed and calm atmosphere, which lead to really positive outcomes and a song we can be proud of. We would recommend this team to work with any children with SEN due to their warm and nurturing approach. ‘Only Boys Allowed!’ This project has launched in two venues – Forest Gate Youth Zone and Beckton Globe Library. Two teams of Young male Artists are running these sessions, mentored by the Musical Director of Living Song. Each team involves an experienced Artist, a Young Artist and a Young Music Mentor (YMM). Repertoire is selected in discussion with the participants of the workshop and membership is growing slowly, but surely. We encourage any boy or young man aged 10-18, who wants to learn more about their voice, how it works and how to develop a natural, healthy voice to get in touch for further information. 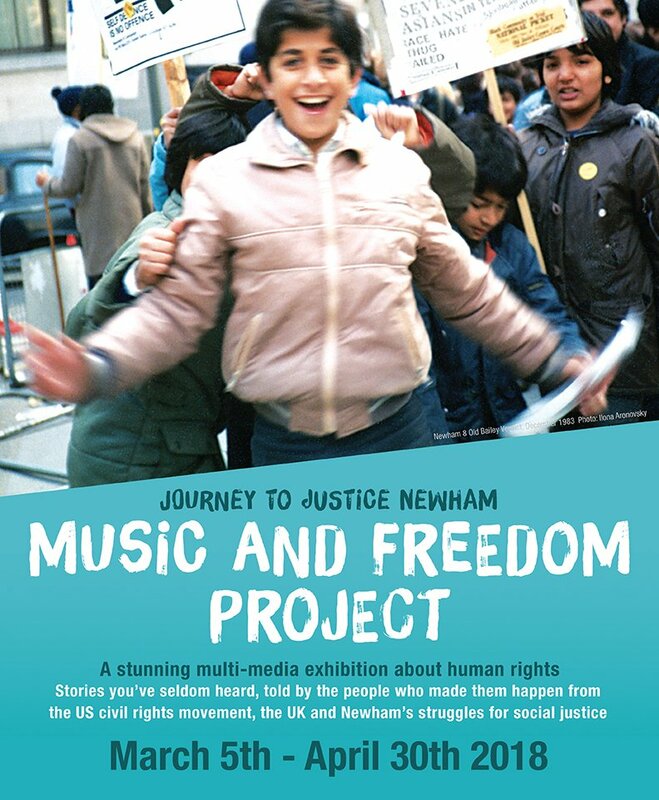 Living Song is so proud to have been a partner for this profound programme of human rights, awareness building experiences for Newham residents and beyond. Right from the Launch at Beckton Globe Library on 3rd March until the exhibition left Newham on 30th April, Journey to Justice fostered fresh perspectives on our Newham history and brought communities together to learn, share stories and write songs remembering and celebrating lesser known heroes from Newham and beyond. You can read the full story and comments at the Journey to Justice website and follow their work as they arrive in Islington in the near future. Year One children at Woodgrange Infants School in Forest Gate, London raised their voices to sing in Swahili this term. Jane Wheeler of Living Song CIC took her guitar in to work with two classes singing songs from Kenya, moving in action and learning the meanings, that linked with their reading book, Lila and the Secret of Rain. We are delighted to offer this course again by popular demand, for the 6th year running. Following on from the CME Institute 2018 at Michigan State University Nick Page will be flying in from the U.S.A to work with us, alongside Mandy Miller and our growing UK team. This is an intensive course over three Saturdays between Nov 2018 – March 2019, offering internationally recognized certification and pathways in voice building, choral pedagogy and conducting with members of the USA and UK faculty. Living Song CIC has secured funding from Newham Council to pilot a vocal ensemble for young men aged 11-18, to be based in Newham. We will be running taster sessions at Forest Gate Youth Zone and Beckton Globe Library in late August / early September, with a view to establishing weekly sessions leading up until spring. Our aim is to engage young men in positive self-development, employability and social action through community building and will involve young artists at every level. Watch this space for further information. Congratulations to Bromley Music Service, who have been successful in their application to Youth Music to fund a two year song-writing project for children with SEND across Bromley. This was inspired by work in partnership with Living Songlast year and we have been invited to partner on the creative side of this project once again. We will be identifying young artists to support the workshops and teacher trainings shortly and very much look forward to working with Bromley Music Service and the team once again. Congratulations to Stratford Circus for their successful application to Youth Music to fund NewYVC and the wider borough Singing programme Newham Harmony. This is a three year project in partnership with Newham Music and Living Song involving the NewYVC choir and thirty primary and secondary schools across Newham. Once again, our Young Artists and Young Music Mentors will be at the heart of workshops, cluster rehearsals and teacher and artist training sessions. Watch this space for further updates and events. The JtoJ travelling exhibition opens at Beckton Globe Library in Newham, east London (DLR Beckton) on Monday March 5th with a launch on Saturday March 3rd 15.00-17.00. With a strong focus on music and Newham stories we explore what makes action for social justice succeed. There will be linked events and workshops at Newham venues during the two month run – details to follow soon. Living Song CIC is an East London based company working locally and nationally to help young people shine and develop through musical activity, in particular singing and creative vocal work. We work with a wide team of highly skilled and experienced artists who are in turn supported by a diverse community of young apprentices offering a model of life long learning.